Sold as a set of 5 mini purse favors. Measures 4″ x 2½” x 4″ at the base. Has a 3½” top opening. Sewn from delicate tulle fabric. Trimmed with antique-style lace, tiny pearls, and clear sequins. Handle is made from silky white cord. Fastens shut with a pretty faux pearl clasp. SEE ALSO: Favor Wraps, Organza Rose Bags, Sachet Favors. Available in one style and color only (as seen in the pictures). Ideal for Parisian, Winter, Fashion, or ladies’ luncheon themes. 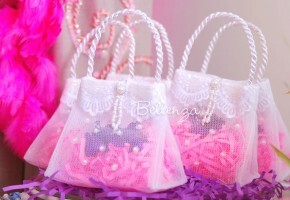 The Kaibeya Mini Purse Favor Bags are popular as bridal shower favors. Sold as a set of 6 Limoges-style porcelain favor boxes. Measures 2″ in diameter and stands about 3″ high. 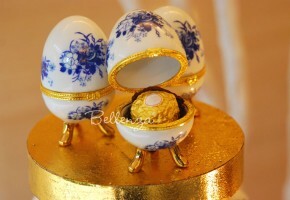 Each keepsake egg is crafted in fine porcelain. Painted with Delft blue floral designs. The hinged top half is secured with a metallic clasp. The interior has an all-white porcelain finish. Stands upright on three gold-painted feet. Superb for a winter fairy tale theme or vintage tea party. 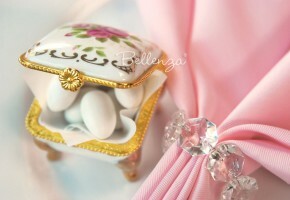 These porcelain favor boxes are popular for boy’s baptism or christening parties. Sold as a set of 6 Limoges-style porcelain eggs. Get 30% OFF (on more than 1 set) with CODE: FIOVALE30. Measures 3″ x 2″ x 1 ¾”. Made of fine porcelain with a brilliant yellow glaze. Opens up into halves, joined by a gold-plated hinge. Closes with a gold-plated floral clasp. This item can be wrapped in our 12′ organza wraps. 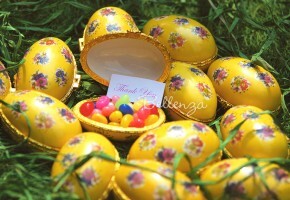 Popular for Easter, Garden, Spring, or Alice Theme. Available at Macy’s (*affiliate link). Has a floral-inspired motif with a hinged, gold band around the box. Is a musical box that plays “If You Love Me” as a tune. Part of the Royal Albert Country Rose collection. Has a matching china set with the same floral motif that can be purchased separately. 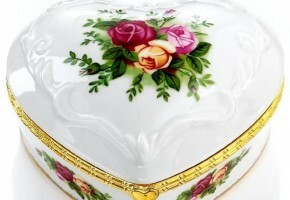 This dainty floral keepsake box is ideal as a tea party gift. Also great as a Mother’s Day gift, gift for the Mother of the Bride, or gift from the Mother of the Bride to her daughter. Sold as a set of 6. Measures 2″ x 2″ square. Stands about 1 ¼” high. Made of fine porcelain material. Embellished with a painted rose design and gold accents. Features a hinged lid secured with a gold clasp. Supported by four gold-painted feet. Ideal for a vintage tea party, Valentine’s, or Parisian party. Made of fine high-quality porcelain. Decorated with a dainty scrollwork pattern around a fleur-de-lis motif. Measures 2 ¼” in diameter and 1 ¾” high. Hinged lid has a gold-edged rim and is secured by a gold-tone floral clasp. Interior is of pure white porcelain. Can be presented in our 12′ organza wraps. 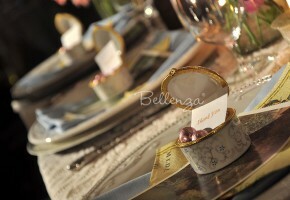 Lovely as favors for a Moroccan, Mad Hatter, or Beach party theme.